I wish I could go back in time to 17th century Naples and personally thank the unknown Italian who first came up with the idea of baking a flatbread crust with tomato and cheese on top. This staple of poor Neapolitans was introduced to America in 1905 in New York’s Little Italy and its popularity has exploded from there. Fast forward to today and there are now several pizza chains worth hundreds of millions of dollars all over the country competing against one another to offer the best pizza possible. Pizza has come a long way in America in 108 years. Gizmodo has now quantified the spread of pizza in America with this cool new map. Specifically it will tell you where the closest pizza chain is in any 10 mile radius. The heaviest nationwide hitters are the ones you would probably expect like Pizza Hut, Domino’s, and Papa John’s but there are some very strong regional players as well. Even more interesting is that they actually have a chart comparing the distribution of one chain versus another which gives you a much clearer indication as to who has a stronger presence where. Also on a depressing note, there are large swaths of pizza deserts in sparsely populated areas in places like Montana, South Dakota, and Nevada where no chains have opened up shop. Of course this map excludes the presence of small independent pizza places which often produce a better tasting pizza than the chains (at least in New York and New Jersey) so this is not a comprehensive map of all areas where one can get pizza. 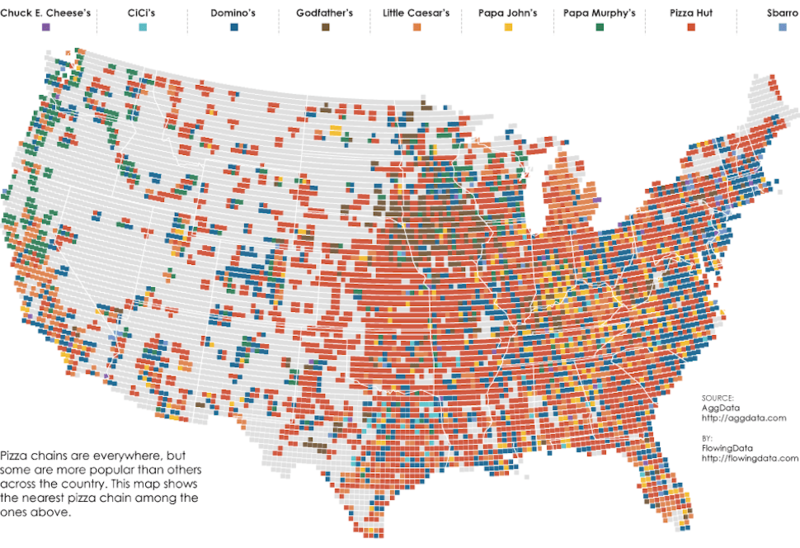 While I may prefer my local, independently owned pizza shop in New Jersey, it is still really cool to see just how much the pizza business has come to blanket the country. Apologies to Alaska and Hawaii.